How do I check and view my received emails? Once you’ve logged into the Webmail service, you’ll see six items at the top of the page: Portal, Email, Address Book, Calendar, Tasks, and Drive. Click on “Email”, and then click on “Inbox” in the menu on the left side of the page. After that, you’ll see a list of all the little love letters you’ve received. When you have clicked on the email you wish to view, it will display as below. At the top of the email, it will tell you the date the email was sent, who the email was from, the email address it was sent to, the subject of the email and the email's size. Ready to reach out? To send an email, log into your email account and click the "Compose" button at the top of the screen. When you click on this, you will be asked to enter the email address you wish to send an email to. The subject of the email needs to be entered into the "Subject" field. After you’ve entered these two items, all you have to do is compose your email and click on the "Send" button at the top of the screen. Adding an attachment is done while composing the email by clicking the “Add Attachment” button, which is highlighted below. After you click this button, you will be able to browse through your files and select the item you wish to attach. When you have chosen your file, simply click “OK”, and your attachment will be uploaded to the email you are composing. When you’re ready to remove an email you no longer wish to keep, simply highlight the email you wish to remove and click on the image of a bin at the top. How do I access my email account management? Your email account management section is pretty important. It lets you create and delete addresses, monitor how much memory you have used, change your passwords and more. 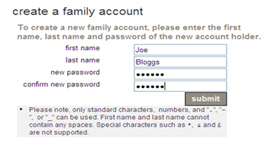 To log in, simply enter your username and password. When you click “submit”, you will be brought to the main menu, which lets you tailor your email accounts to fit your needs. Changing your password is safe, smart and simple. Once you are logged into the email account management section, you click on "change your password". Next, enter your existing password and the new password you want to set. Then press the "submit" button. After that, you’ll receive a confirmation that the password has been changed. That’s it. Simply click the “continue” button to return to the main menu. 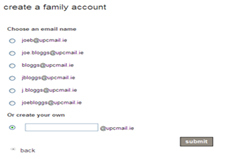 Once logged into your email account management section, click on "administer your family account". 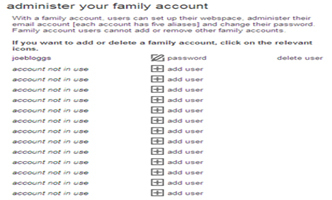 Select an available account and click on "add user". Enter in the first and last name along with the password. The next screen will present you with a number of options you can use as your email address. Alternatively, you can enter your own in the text box at the bottom of the list. Click “submit" once you have selected or entered the email address you wish to set up. You will then get a screen confirming email address and details. Click "Yes" on this if you are satisfied the details are correct. This new address will now be listed in the "administer family account" screen, and can be accessed through the webmail service on the Virgin Media homepage. And they all lived happily ever after. We hope this helped, and we hope you enjoy using your free account.